This is a multi-part trip report, if you haven't already you should start with Part 1. Remember too that you can click on any of the photos to see larger versions of them. We overslept this morning but still took time to enjoy the Belgian waffles at the hotel's free breakfast bar, which Bryan has been looking forward to all week. 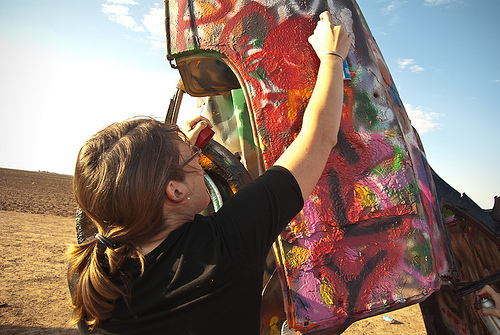 Mandy woke up a little grumpy but a trip to Cadillac Ranch, just a few miles from our hotel, fixed that. Click to see this panorama larger. 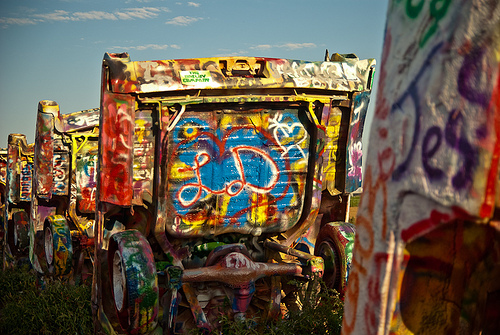 Cadillac Ranch is a sort of strange public art project, a set of ten Cadillacs half buried in a cornfield just off the interstate. They're stuck into the ground at the same angle as the sides of the great pyramids. There's a pulloff on the access road, and a gate, and a path. The black paint we'd brought from home worked fine, and though our white didn't work we found some red paint in the scattered cans around the cars. 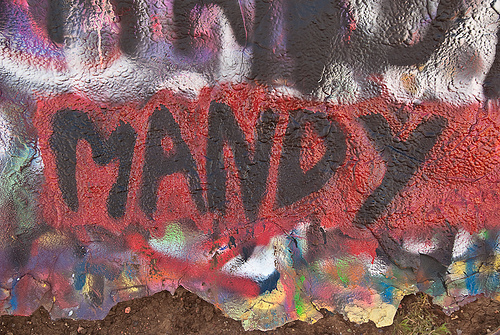 Bryan played photographer for the most part while Mandy and I tagged Cadillacs. As we left, we gave our cans to a very appreciative bald guy who'd forgotten to bring his own. Back at the hotel, we loaded the car one last time. 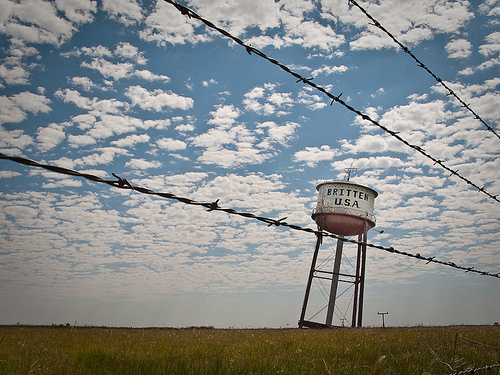 Groom, Texas is not only the home of the second largest cross in the western hemisphere; it's also the location of the intentionally crooked water tower at the long-defunct Britten truck stop. 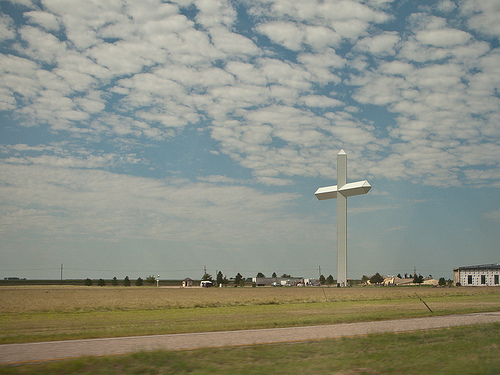 Our drive has taken on the distinct feel of a goofy route 66 teenager road trip. Mandy refuses to get out at the water tower, preferring to stay in the car and listen to her audiobook rather than crouching in the ditch with her parents, taking pictures. 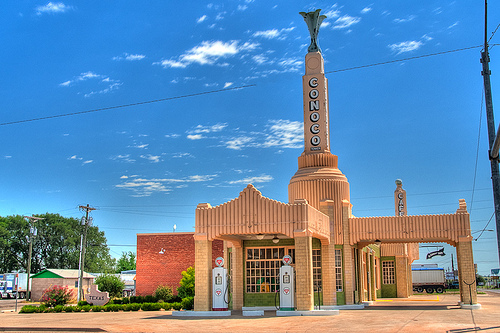 The art deco gas station in Shamrock is the last item on Bryan's list of roadside attractions. Now it's just a long slog home. We eat lunch at Chipotle in Oklahoma City, a snack in Van Buren, and we're home around bedtime.